10.04.2019 18:22:04 - Most of the time, plastics would be useless without additives. Additives facilitate the processing of plastics, protect against heat and UV rays, and expand the range of properties by modifying material characteristics. (live-PR.com) - “Only additives make it possible to permanently use plastics in ever new applications” explains Oliver Kutsch, CEO of Ceresana. The market research company analyzed the complete world market for all major plastic additives for the second time: fillers, plasticizers, pigments, flame retardants, stabilizers, impact modifiers, slip agents, antioxidants, blowing agents, as well as other plastic additives. demand for plastic additives amounts to approx. 33.3 million tonnes every year. More than half of this amount is processed in Asia-Pacific. North America and Western Europe follow at a great distance. As plastics are more practicable and lighter most of the time, they increasingly replace other materials such as wood or metal. Therefore, demand for plastic additives will continue to increase in the years to come. The latest study of Ceresana examines the respective development of particular plastic additives in the 16 most important countries in detail. In this study, the use of additives in various plastic types is examined in more detail, that is, in polyvinyl chloride (PVC), polyethylene, polypropylene, polyurethane, engineering plastics, and other plastics. Since PVC is a brittle, hard, and white material, the worldwide highest amount of additives is applied in this plastic type to adapt it to diverse applications. PVC manufacturers are by far the largest consumer of plasticizers, which make plastics softer, more flexible, smoother, and more elastic. For example, plasticizers are used for the production of cable sheathing and floorings. Over 50% of the worldwide used plastic additives are fillers. Plasticizers and pigments rank second and third. More than 17.6 million tonnes of fillers are utilized for plastics every year. In general, cost-effective fillers increase the volume of the mixture of materials without altering the main characteristics. Additionally, the production of highly-filled plastics with properties tailored to meet the exact needs of individual costumers is rising as well: They contain up to 85% of fillers, possess excellent mechanical properties, and are even more cost-effective than conventional materials in many cases. The following plastic additive types are examined individually: fillers, plasticizers, pigments, flame retardants, stabilizers, impact modifiers, slip agents, antioxidants, blowing agents and other plastic additives. Application areas analyzed in this study are: packaging, construction, transportation, electrical and electronics, industry and other applications. Plastic types examined individually are: polyvinyl chloride (PVC), polypropylene (PP), polyethylene (PE), polyurethanes (PUR), engineering plastics and other plastics. 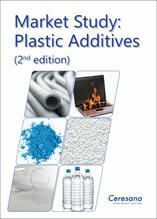 Chapter 3 provides company profiles of the largest manufacturers of plastic additives – clearly arranged according to contact details, revenues, profit, product range, production sites, and profile summary. Extensive profiles of 69 manufacturers are given, including Aditya Birla, BASF, Clariant International., DIC Corporation, DowDuPont, Evonik Industries, Imerys, Lanxess, Mitsubishi Chemical Corporation, and Rio Tinto.